Internal Revenue Service says: "you are eligible to receive a tax refund of $863.80"
Hello, I am Miss Young. I received this story from a friend. Let me call him Jamie. Go to the homepage to see more stories. Does the IRS pay out tax refunds on credit cards Visa and Mastercard? Have a notification of a refund of 863.80 or is it yet another amazing scam? Most of the buttons on the forms and so on seem to work, including the IRS website. It applies to all countries. 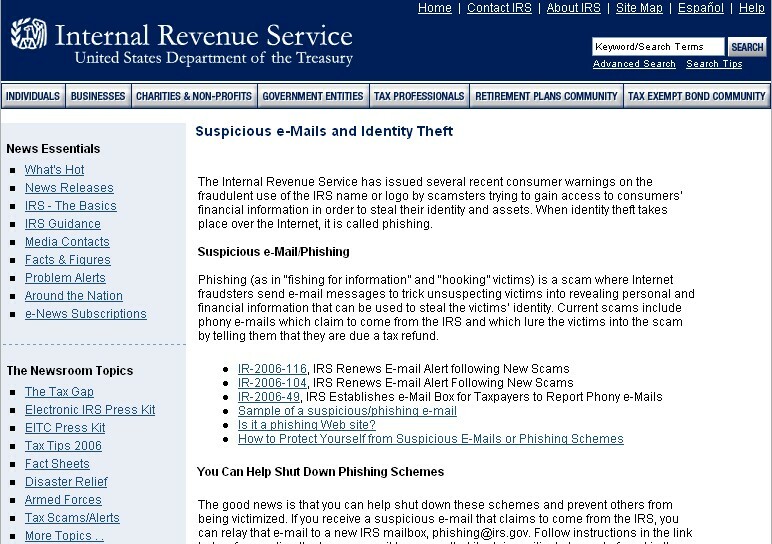 Subject: IRS Notification - Please Read This. After the last annual calculations of your fiscal activity we have determined that you are eligible to receive a tax refund of $863.80. Please submit the tax refund request and allow us 6-9 days in order to process it. © Copyright 2006, Internal Revenue Service U.S.A. All rights reserved..